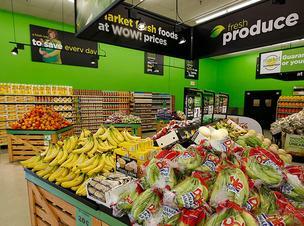 * ... GROCERS: Fans of the local Fresh and Easy grocery stories are lamenting over the British parent firm's decision to unload its unprofitable U.S. enterprise. If Fresh and Easy leaves our market, it will join Young's Market and the Green Frog on the list of smaller grocery stories that have left our community. On the upside, the Dollar General markets like the one that occupies the old Young's store hold promise in filling the void left by the locally owned grocers. * .... OOPS: Today's morning chuckle comes from reader Darlene Stewart: "This happened on a recent visit to my eye doctor in Oildale. In the crowded waiting room a man came in with his dog. They were able to find a seat and while waiting the dog seemed nervous and fidgety, which seemed unusual for a 'service dog.' Shortly thereafter, an observant woman asked the man if he was there for an eye exam. Looking surprised, he said, 'No, for my dog's shots!' Embarrassed but good naturedly he laughed as he left with his dog to go next door to the veterinary office!" 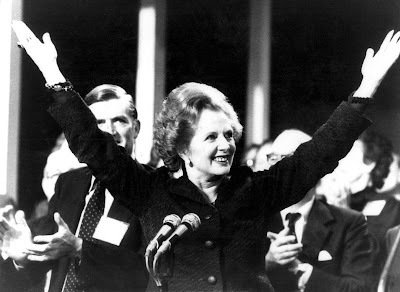 * ... THATCHER: Do you remember when former British Prime Minister Margaret Thatcher spoke at the Bakersfield Business Conference? Phyllis Adams was a hostess at The Tavern by the Green then and remembers with the late British leader had dinner there. "She was most gracious in remarking about the restaurant and on leaving stopped to say thank you to me. A more charming lady is hard to find." * ... SMALL TOWN: One of Bakersfield's great charms is its small-town feel even when we continue to grow. Mary Moreland said it best when she noted that her soon-to-be-married niece, who lives in Ann Arbor, Michigan, sent a wedding announcement addressed simply to 'Uncle Car and Aunt Mary' with no last name and to the wrong address. "She had the right street but missed the right number by 2000. (But) our mailman got the letter to us! Living in Bakersfield does have many advantages." * ... DRUMLINE: The Bakersfield College drumline is in Dayton, Ohio, competing in a national drumline championships. But it hasn't been a trip without troubles. It turns ou the 37 students, instructors and director Tim Heasley got caught up in the American Airlines snafu that grounded thousands of air craft, but the crew finally made it to Ohio. Wish them luck. * ... KOREA BOUND: Jim Bell and his wife Donna are in South Korea spending a week representing the Rotary District 5240. Jim recently retired as vice president of Clear Channel Radio and told me the trip is to visit a "sister district" which includes Busan and Ulsan, South Korea. Certainly an interesting time to be on the Korean peninsula. * ... BAKERSFIELDISM: Gene Bonas says you may be a Bakersfield old timer if you "watched sporting events on the asphalt surfaces at Washington Jr. High (now the Bakersfield City School District office complex).